A couple of weeks ago, I headed out to Maryland’s Eastern Shore. Mecca for wintering ducks, and in particular in Cambridge, Maryland. I knew that near the Dorchester Visitor Center at the Route 50 bridge was a great place to find some ducks. Arriving, I saw that there were a good number of Surf Scoters. 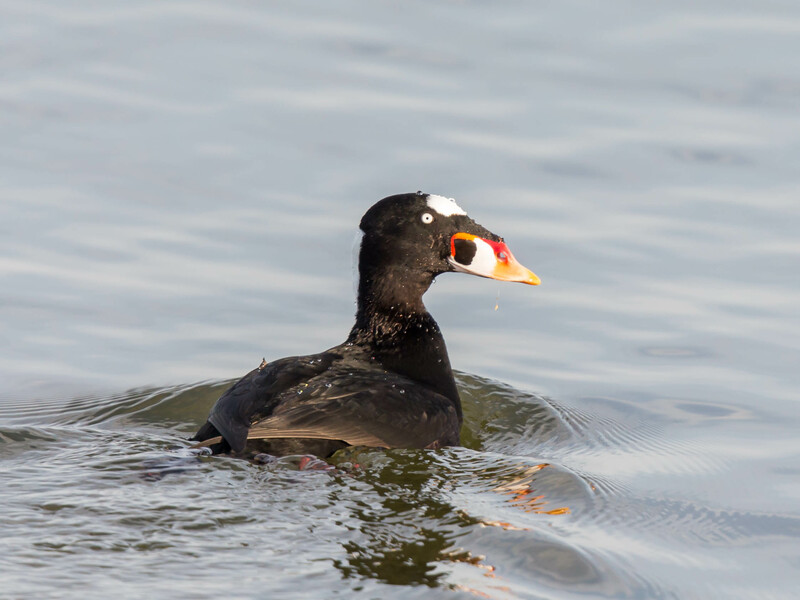 Surf scoters are sea-diving ducks that overwinter along the Chesapeake Bay and along the Mid-Atlantic coastline. Also called “skunk-headed coot” due to their odd head coloring, these ducks spend the summer months on their breeding grounds found in northern Canada. I’ve only seen them once before, and I was so excited about the chance of possibly getting close to them. So with my Canon 1DX paired with the 500mm L lens and Canon 1.4X III extender mounted on a tripod, I walked slowly to the water’s edge. It took all but a moment for them to notice my presence and off they went. And so the game began…for the next two hours I would watch the flock all dive down together at the same time, leaving one or two behind as scouts. I’d walk a little closer to where they were. Up they would pop up together, see me and quickly swim off. I waited and waited. I tried to slink up by walking further away and then back in. But they were just way too smart. Finally taking my kit off of the tripod and walking out on a quite narrow boat ramp, I managed to grab a couple of closer shots. But off they went again beyond reach. It was worth the wait, but I knew more ducks were awaiting for me. Those who are much more cooperative. And so the life of a bird photographer. You win some and you lose some. If you’re just getting started in bird and wildlife photography, I’m offering a photography workshop through Capital Photography Center on April 22, 2016. This class will provide you all the tips you’ll need to be successful in the fun and challenging photographic subject. For more information on the Getting Started in Bird Photography Class CLICK HERE. You sure are very patient to wait for these ones 🙂 great shot too! They drove me crazy Andy. Way too shy smart. I did certainly try though. Thanks! They are one weird duck, but I love them. Thanks Fatima and enjoy the weekend. Thank you so much Mcbery and thrilled to share a new bird with you. I found a skull of one years ago on a beach. Very interesting structure on that bill! Wow, I can’t even imagine what that might of looked like. Thank you so much for sharing. Post was timely for me. In Cambridge on Wednesday and got to see them thanks to your post. They were too far out to get a really good shoot even with a 500mm and a 2x. There were also 4 pintails diving for food, again a little too far out but it was nice see them out there. Wonderful that you got to see them there Jake. Yes..they were far out, thus the long wait. I saw those pintails also waaaay out there. Glad you got to enjoy the gorgeous day yesterday.